The Honda Civic Sedan and Coupe have been Canada’s best-selling passenger vehicles for a number of years. Honda has announced that the 2019 Honda Civic Sedan and Coupe will be arriving this fall at dealerships, with a number of new features and updates, as well as an all-new Sport trim. The refreshed Honda Civic Sedan and Coupe will feature more safety than ever before, with standard Honda Sensing technology. The technology will be standard on all trims for the first time for the Civic. These technology features include Adaptive Cruise Control with Low-Speed Follow, Collision Mitigation Braking System™ with Forward Collision Warning, Lane Keeping Assist System and Road Departure Mitigation with Lane Departure Warning, as well as automatic high beams. The exterior styling of the 2019 Civic Sedan and Coupe have been refreshed, featuring subtle updates that give the vehicle a more aggressive impact and a more premium, luxurious feel. The lower bumper gives the Civic a wider look and compliments the new blacked-out headlight treatment featured on the 2019 models. The signature “wing” design on the grille was enhanced with a new gloss black treatment. On the Touring trims, LED headlights have been upgraded and given a new design which offers a wider and longer beam. The interior of the Civic Sedan and Coupe was not forgotten in the styling updates for the 2019 models. The improvements are subtle, but still, offer drivers a more refined driving and ownership experience. The Display Audio system received an update, which includes a new volume knob and physical buttons for key functions. The system is standard on LX trims and above. The steering wheel controls have been redesigned for a more intuitive operation, and the centre console features larger cup holders. The dash trim is offered with gunmetal grey on LX trims and a metallic finish for Touring sedans. On the all-new Sport trim, the dash trim is offered with an embossed finish. Positioned in the 2019 Honda Civic lineup between the EX and Touring trims, the 2019 Civic Sedan and Coupe Sport trim is offered for the first time this year. The Sport utilizes a 2.0-litre engine. On the Coupe, this is offered with either a 6-speed manual transmission or a continuously variable automatic transmission (CVT). The sedan offers only CVT. The new styling of the Sport trim features fog lights with gloss black trim, 18-inch wheels, a black-painted decklid spoiler, Sport badging and a sport muffler. 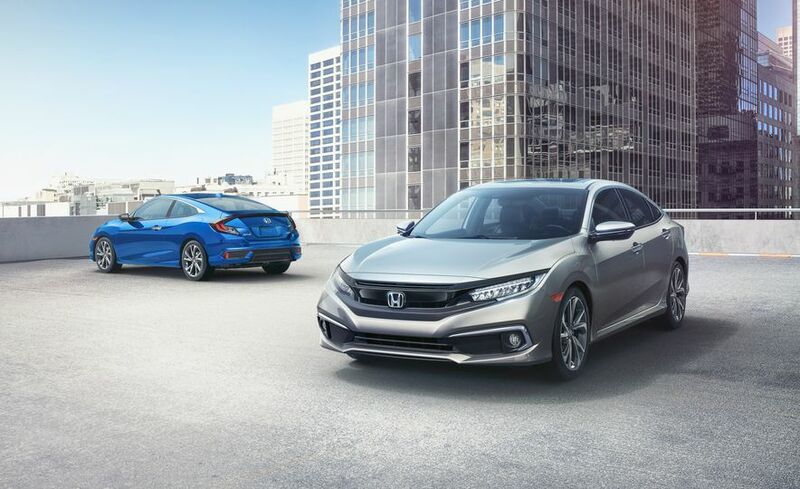 For more information on the 2019 Honda Civic Sedan and Coupe, visit us at Henley Honda today.